The prepaid energy meter with anti-tamper function has extend terminal cover, anti-tamper measurement chipset AD7751 instead of AD7755, and have extra one current transformer except shunt, so there is two measurement loops and the meter will measure energy consumption correctly even current is reversed, details of four situations as following. 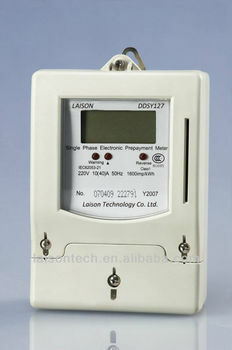 Single phase electronic prepayment meter complies with IEC 62053-21. The meter adopts micro-electronic technology, has high precision, low power consumption. The meter will remind the user to purchase the electricity by alarm when the electricity remained is limited, and cut off the power supply automatically when the electricity use up. It's also able to limit maximal consuming power, anti-tamper function is optional. Each meter match with one memory card, and the meter can exchange the data with card bi-directionally through the card read device. User won't lose electricity even he lost the user card, because a renewed card is acceptable.